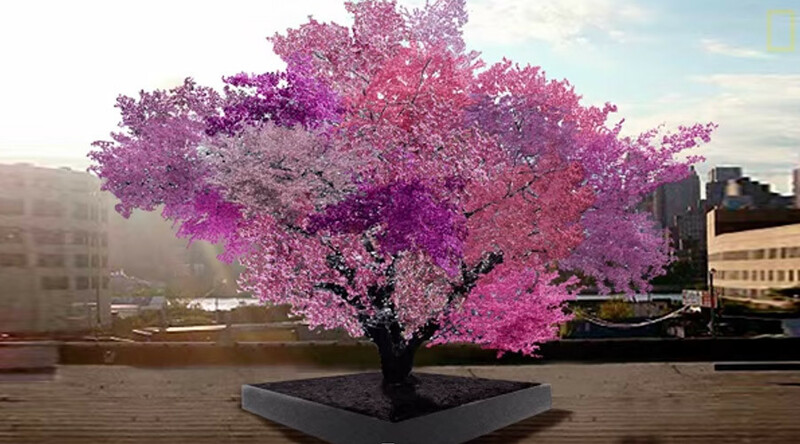 A green-fingered New York art professor has created an amazing horticultural hybrid, the Tree of 40 Fruit, which yields different colored blossoms and a variety of fruits all at once. Using a technique called “sculpture through grafting,” Sam Van Aken of Syracuse University takes a budding sliver of branch from a fruit tree and grafts it into a similar-sized hole on the host tree. The branch is taped in place and left to assimilate with the host over the winter months. When spring comes, Van Aken prunes the cutting hoping it will grow into a full branch. “I can design and essentially sculpt a tree and how it blooms,” Van Aken, Professor of Art at Syracuse University told CTV News. The hybrid trees grow and support 40 varieties of fruit, including many antique and native varieties of peaches, plums, apricots, nectarines and cherries. Initially, the idea began as art installation combing Van Aken’s artistic eye with his experience of being raised on a farm and work managing a university orchard with 250 varieties of fruit trees. “I wanted people to have this experience where a tree is blossoming in all these different colors or growing all these different kinds of fruit all at once,” Van Aken told Time. For most of the year it’s a normal-looking fruit tree. But then spring comes and it blossoms in different tones of pink, white, and crimson, and in late summer it bears 40 different types of fruit. As Van Aken continued researching the project, he noticed that varieties of stone fruit weren’t available in stores because of their size, color or short shelf life, and the project turned into a conservation effort for hard-to-find varieties. He first began his grafting technique in 2008, and depending on when the tree is planted it takes about five years to develop each tree and graft 40 varieties to the host. The professor keeps a record of each tree, recording when the various fruit branches flower and yield fruit throughout the growing season. To date, Van Aken has created and placed 16 trees in museums, community centers, and private art collections around the country from California to Massachusetts. In the future, he aspires to create a grove or small orchard of hybrids in an urban setting.